The School Health and Nutrition Program is an integral part of the DepEd System where health personnel are on the frontline in the implementation of the programs in the school, district and division levels. With the official launching of the Essential Health Care Program ( EHCP) on August 29,2012 in the Division of Tawi-Tawi, the role of the nurses became more pronounced and recognized being one of the key persons in its implementation. This has kept the Health and Nutrition Section (HNS) on the move often than before as the program needs regular monitoring and evaluation, lobbying with the local government units, validation of the expansion schools for Year 2, orientations, and following up of other concerns. This gave the section the opportunity to visit districts and schools regularly and poster a stronger working relationship with school heads, teachers, colleagues and even the parents, LGUs and community. EHCP as a flagship progam of DepEd serves as an energiser and a catalyst for HNS to strive more to help nurses in the field accomplish their tasks and eradicate the notion that nurses are merely sitting pretty in their clinics. This is also a venue for improving communication skills both written and verbal, as there is a need to constantly be connected with stakeholders. The skill is enhanced in trying to persuade partners to appreciate and eventually support the program with the aim to help school children become healthier and thereby improve their school performance and make a difference in the lives of the school children through simple and yet cost- effective means of daily activities of toothbrushing and handwashing and bi- annual deworming. DepEd, with or without Fit for School or partner agencies and foreign funders are mandated to construct handwashing facility and implement EHCP in schools with legal bases: DepEd Order 56, s.2009 and DepEd Order 65, s 2009. Daily handwashing with soap and water, toothbrushing with fluoride toothpaste, and deworming have proven to be effective interventions that considerably improved the health status and educational achievement of school children in the Philippines. 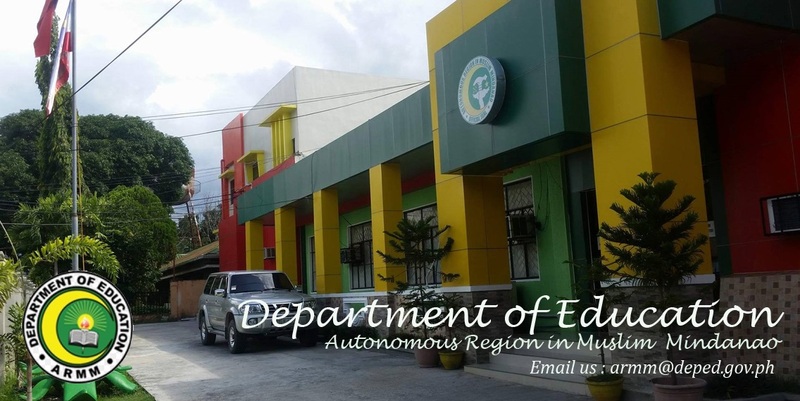 So far the Department of Education of the Autonomous Region in Muslim Mindanao (DepEd ARMM) implemented the program in selected schools in the divisions of Maguindanao I and II, Lanao del Sur IA and IB, Lanao del Sur II, Marawi, and Tawi-Tawi under the Essential Health Care Program (EHCP) model in partnership with GIZ. We are very pleased to learn that based on In view of the positive experiences, DepEd ARMM made the decision to scale up the EHCP to the island divisions of Basilan, Lamitan and Sulu. The first step in the extension of the program was an orientation and planning workshop carried out on January 14-16 in Zamboanga City. GIZ is delighted of the direction the ARMM education sector is taking and will provide assistance from distance as much as possible. GIZ is integrating EHCP into the Alternative Delivery Model (ADM) carried out by BRAC. Both EHCP and ADM are part of the Basic Education Assistance to Muslim Mindanao-ARMM (BEAM-ARMM) program funded by the Australian Government. 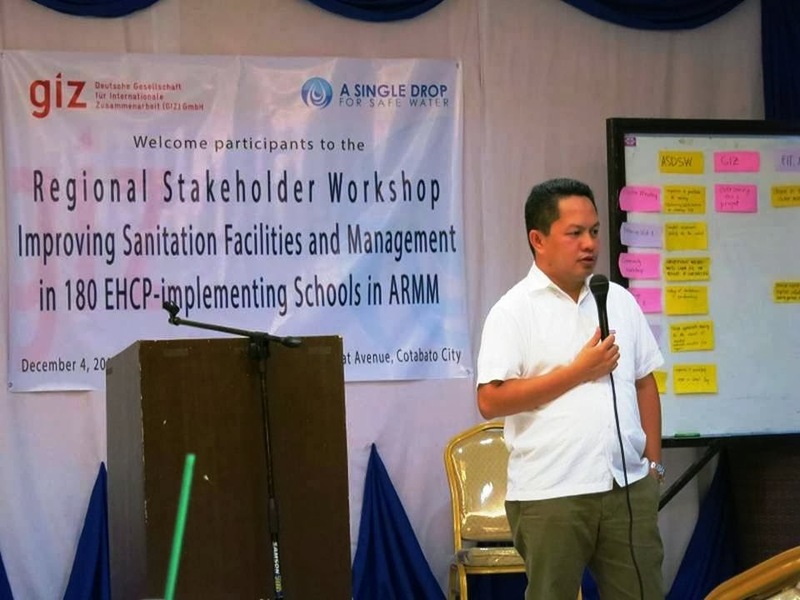 EHCP focuses on simple and evidence-based health interventions in elementary schools to improve the educational attainment of students, while the ADM centers on the delivery of quality basic education to children in remote areas of ARMM. The project establishes BRAC Learning Centers (LCs) in regions not covered by the formal education system.There are important areas of convergence of both programs that relate to the building of local capacities in school health and hygiene. To capitalize on these points of contact, BRAC and GIZ collaborate to integrate EHCP into their LCs with the assistance of GIZ and the NGO Fit for School Inc (Fit Inc). Initially EHCP implementation is piloted in twelve LCs in Maguindanao. GIZ provided a new model of prefabricated group hand washing facilities based on a simplified and optimized design. Both partners are looking forward to further fruitful cooperation with BRAC, which will help increasing the outreach of EHCP and improve the social and economic opportunities of the children in the ARMM. Sanitation is vital for the good health of school children. Studies show that clean and functioning sanitation facilities enable children to attend school more often and stay in school longer. Accordingly sanitation is critical to the long-term goal of alleviating poverty in ARMM through the delivery of basic education. The regional stakeholder workshop held in Cotabato City on the 4th of December 2013 marked the start of the project. The purpose of the event was to discuss the project design and plan upcoming activities together with stakeholders. We would like to thank all participants for the lively participation and the interesting discussions. We are looking forward to a close collaboration with partners and communities and are confident that the project will be a success. BEAM-ARMM Dressmaking Package ready for turn-over. Making, Parang, Maguindanao (February 26, 2014)- The AusAID-funded BEAM-ARMM program today turns over a dressmaking package to Making Integrated Vocational and Technology High School (MIVTHS) in Parang, Maguindanao. The ceremony was headed by DepEd-ARMM Assistant Secretary for Operations Noor Saada and BEAM-ARMM TVET manager Peter Bellen and received by the school principal Dr Rebecca Kabagani. Present during the ceremony are LGU representative Parang Councilor Walid Macapages, PTA president Datu Usman Lidasan, a full force of barangay kagawad, BSE regional TLE coordinator Dr Corazon Maguate, teachers, and students. BEAM ARMM TVET manager Peter Bellen detailed dressmaking package to include twenty-five (25) sewing machines, five (5) high-speed sewing machines, three (3) electric flat iron and five (5) steam press. Municipal councilor Walid Macapeges expressed concern over rapidly growing population as a commercial and educational hub in Northern Maguindanao; readiness to continue working to support education access in the area. He also said, we welcome and are thankful for the continuing and future partnership. PTA President Datu Usman Lidasan expressed his gratefulness to the support in helping improved the learning of their children. School head Dr Rebecca Kabagani committed to maximize the package and assured the officials present it will be used for the stated purpose. She revealed, dressmaking is the latest TVET course offering of the school. 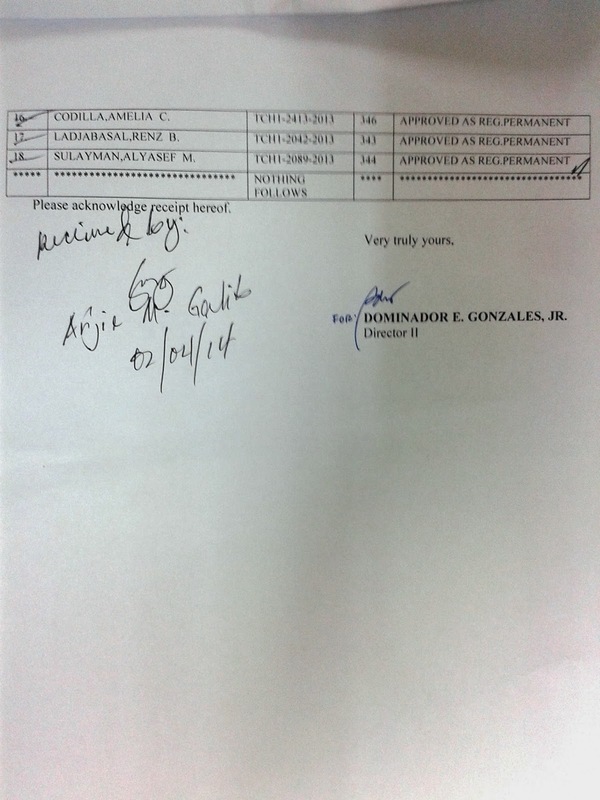 Early on, the school also started food trade course out of the SBM grant and computer course as a recipient of the DepEd computerization program. Ceremonial turn-over of garment tools and equipment from BEAM-ARMM Program to TTSAT. (L to R) BEAM-ARMM TVET manager Peter Belen, DepEd-ARMM BSE chief Dr Fatima Abubakar and TTSAT principal Mohammad Nur Tidal. Bongao, Tawi-Tawi (February 21, 2014) – BEAM-ARMM handed-over a package of garment tools and equipment to Tawi-Tawi School of Arts and Trade (TTSAT) today. The package consists of: twenty-five (25) regular sewing machines with complete accessories; five (5) high powered sewing machines, steam pressed machine and flat irons, three (3) tailored-cutting tables and a sets of body-hangers. The turn –over ceremony was held at the school's garment shop of TTSAT. 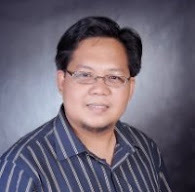 The AusAID-funded BEAM-ARMM was represented by Techvoc manager Engr. Peter Bellen who handed-over the package to TTSAT principal Mohammad Nur Tidal in a simple ribbon-cutting ceremony. Witnessing the turnover were DepED-ARMM BSE chief Dr. Fatima Abubakar, ORG chief of staff Amihilda Sangcopan, Bangsamoro Youth Affairs executive director Anwar Upahm, ORG sports director Al Trekke Dayan, Municipal accountant Mrs. Abdulmunap represented Mayor Jasper Que, school principal Wahid Sadat represented SDS Nuhayla Amirulhadz and provinicial mufti Abdulwahid Inju. The PTA officers were present headed by its president and police officer Jumli with some officers. The school faculty was also in full force. BSE chief Dr Fatima Abubakar said, TTSAT is just one of the twenty-two (22) schools to be supported under the BEAM-ARMM component is supporting 22 secondary schools in the ARMM under its Tech Voc Program Component techvoc component and is also strategically connected with preparation for senior high school implementation which is expected to be mandatory for all junior high graduates by SY 2016-17. Mindful of the essence of responsibility and accountability, Engr. Bellen, cited a line in “Spiderman” movie, saying “great power comes great responsibility”. And thus it goes, more tools and equipment means more responsibility. On his part, Mr. Tidal assured the best of what he and the whole faculty can do for the maximum utilization vis-à-vis the development of the technical skills of the TTSAT Senior High School Voc tech learners. The PTA president, as a police officer, committed to do his part in as far as the safety and security of the tools and equipment is concerned. As part of the continuing reform of the current ARMM leadership, DepEd-ARMM will now pursue geo-tagging public schools in the region. 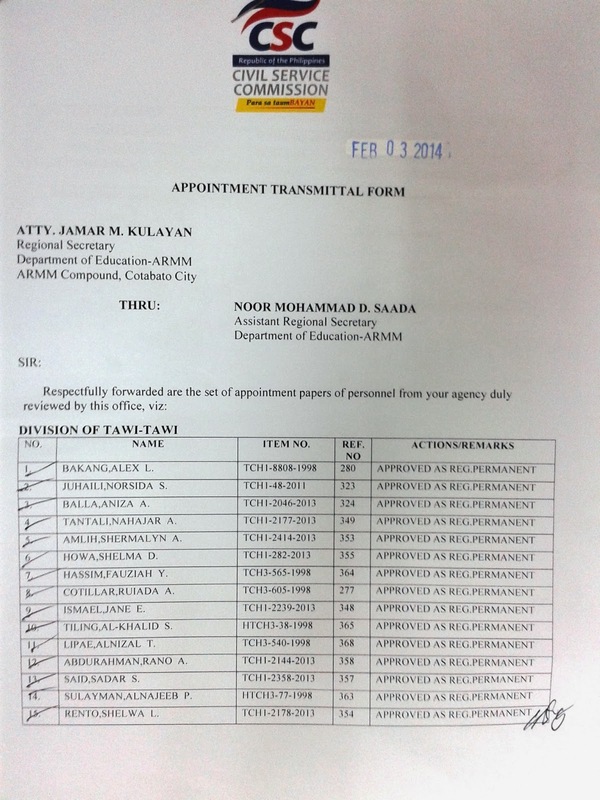 In a regional memorandum issued last February 20 (DepEd-ARMM Order 53, series 2014), Regional Secretary Atty. Jamar Kulayan informs the DepEd-ARMM bureaucracy that geo-tagging will now cover selected public elementary and secondary schools. The instruction is to cover one district per division and to cover all public elementary and secondary schools in the said covered districts. Two (2) teams from the Policy and Planning Division (PPD) and the Office of the Regional Secretary will led the process. Aside from the geo-tagging activity, the team will also cover assessment of school infrastructure and implementation of the school-based management (SBM) grant. According to PPD Chief Marjuni Maddi, this an exercise of increasing accountability and transparency, to insure resources are invested efficiency, in areas where are really needed (equity) and to respond be able to tailor government interventions based on the needs of the community. We were conscious about our obligations as graduates of District Supervisory Leadership Program (DSLP) of SEAMEO-INNOTECH. Much has been spent to enhance our capacity and much is expected of us. Together with topnotchers of the National Qualifying Examination for School Heads (NQESH), we participated in the Program Implementation Review (PIR) and Planning Workshop for BEE and BSE teams. Videos intersperse with PowerPoint presentations, innovative practices with open forum, NAT with RAMSEA results. On the 5th day of the review, we were feeling the physical rigor and expected just to get through. We realized something unusual is about to unfold. Training staff start to spread huge white papers on the floor. We were instructed to put all the chairs and tables to the side of the hall. Early on, we were instructed to bring pillows. Now each one of us is holding our pillow and wondering what’s about to happen; this is unusual. Then lights were turn off with a soft utterance for the participants to lie down on their back with their pillows. I ask myself, is this going to be a sleeping session? We realized this is going to be a dreaming exercise. As we lay on our back, the facilitator started to usher us to sleep, telling us about our strengths, about our peak experiences, about our recent successes, about our key learning. For the next hour and as we were usher to dream, we were reminded to think only of one thing, “think DepEd-ARMM!”. As we went to dream about want we need or want for DepEd-ARMM, for the ARMM children, for our schools; we can feel a general silence in the room. The soft music in the background was setting the mood. In no time, we have entered the sea of dreams. It did not matter what is our sleeping style. Half asleep I can recall some of the instrumental songs playing in the background. Elton John’s ‘Sacrifice’ remains me of the patience we have to endure to make a difference; Whitney Houston’s ‘One moment in time’ reminds me of the need to seize the opportunity as we will only pass this way but once; the song ‘I want to know what love is’ reminds us about its power, how love can move us to be selfless, to be giving, to look for those under our care. The moment turns into minutes, the minutes into an hour. The lights were turn on gradually as we heard the voice of our facilitator ushering us to wake up. We felt so comfortable! It was like sleeping for hours! As we were all awaken and back into consciousness, the facilitator requested us to write one word we got from our dreaming exercise. One word we can associate with ‘think DepEd-ARMM’. One metacard after another was posted on the board - commitment, commit, wake up, transform, advance, children, dream, recollect, awesome, excel, change, bold, peaceful, love, act, reality, align, free, moving, innovation, teachers, terrific, teach, leaders, assist, fortitude, innovate, holistic, equated ad performance. Afterwards, we were dismissed for the remaining of the afternoon. The amazing part is when we return to the training hall, our facilitator wove our individual dream into one coherent whole and in the form of a poem; here is our collective dream for DepEd-ARMM. Thus is my ‘dreaming exercise’ experience. While most program reviews and planning workshops are cognitive, i.e. appealing to the mind; this one appealed to our heart. With our heart and mind connected, we were awakening to strength-based planning called ‘Appreciative Inquiry’. This experience forever changed our mindset. I am reminded of my Islamic roots – education is not just about ta’allum (cognition) or tarbiyah (training), it is also about ta’dib (attitude, change of heart). 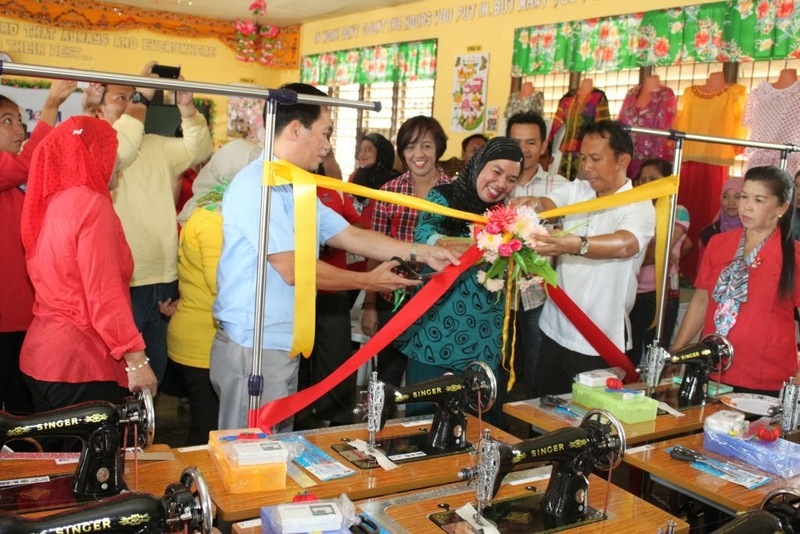 Bubong, Lanao del Sur (February 12, 2014) - The Australian Government through the BEAM-ARMM had handed over Dressmaking equipment package to East Bayabao National High School in Lanao del Sur IB Division. According to BEAM-ARMM Voctech manager Peter Belen, the package consisted of 25 regular sewing machines with complete accessories; additional five (5) high powered sewing machines, steam pressed machine and flat irons. The hand over was spearheaded by Mr Rolly dela Cruz of DFAT Aus Aid and Ms Ina Aquino, the program Director of BEAM ARMM. At hand to witness the turnover were LGU and BLGU representatives, PTA officials, faculty members and students, division and regional officials. BEAM-ARMM Deputy Team Leader Ms Aquino reiterated the school’s responsibility in the proper use and maintenance of the equipments; in turn accepted as a challenge by the school and idivision heads. The PTA president promise to monitor the school and the proper use of the donation. Regional TLE Coordinator Corazon Gutierrez-Maguate said this package is crucial and timely for DepEd-ARMM high school beneficiaries as they level up with the K to 12 requirements which is now being benchmarked through the Philippine Qualification Framework (PQF) and in turn is aligned with global qualifications.